The glider gives strength and comfort without any compromises about maintenance. The aluminum frame assembly is easy, do not require any effort and much time. Many hours of smooth rocking to figure. This glider is low maintenance, easy to clean. Sharing special moments in your own backyard is easy with the PNT-803-S Patio Swing from CorLiving. This comfortable swing will give you years of enjoyment. The warm grey steel frame is complemented by a beige arched shade canopy and seat cushions. The shade-creating canopy slips in place securely and is made from high quality weather-resistant poly-cotton. Rest assured you will swing comfortably in the 3-inch tufted seat with its 4-inch foam topped backrest. Gently sway your afternoon away! With only simple assembly needed upon delivery, you can complete your patio in minutes. Sharing special moments in your own backyard is easy with the Wood Canyon Patio Swing from CorLiving. This heavy duty wood swing creates a rustic look on any patio or outdoor space. The durable 3-ply solid wooden frame is stained Cinnamon Brown and complemented by a matching wooden seat hung from a rugged chain. With only simple assembly needed upon delivery, you can complete your patio swing in minutes. One-Seater Wicker Glider The glider gives strength and comfort without any compromises about maintenance. 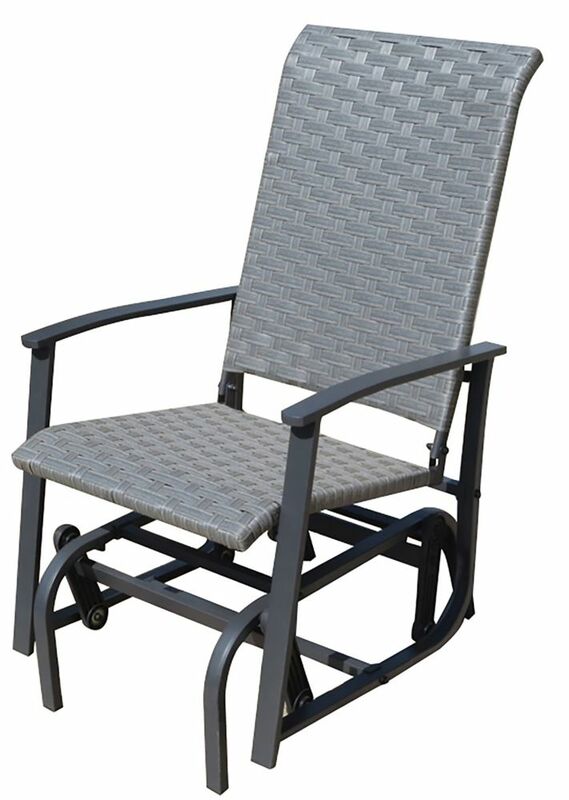 The aluminum frame assembly is easy, do not require any effort and much time. Many hours of smooth rocking to figure.